The Temperate bass are starting to show around our part with last weeks warm up, I’m not real sure what this cooler wet weekend is going to do to them. 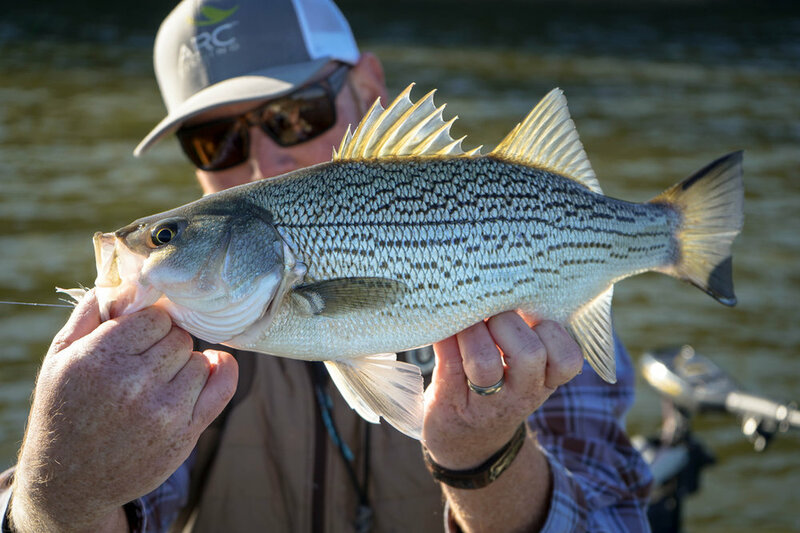 We were able to find some whites and hybrids off the face of the dam, most the bigger hybrids were still out in deeper water. Mostly fishing sink tips and baitfish patterns. We’ve got the water and had the temps fish were starting to run out of the lakes and up the creeks to do their spawn thing. Like I said not sure what this weekend is going to do to the but it’s always worth getting out this time of year. The past week and a half have been some nice relief, 2 weeks ago the overnight low was -2. Water has thawed and fish are starting to wake up. 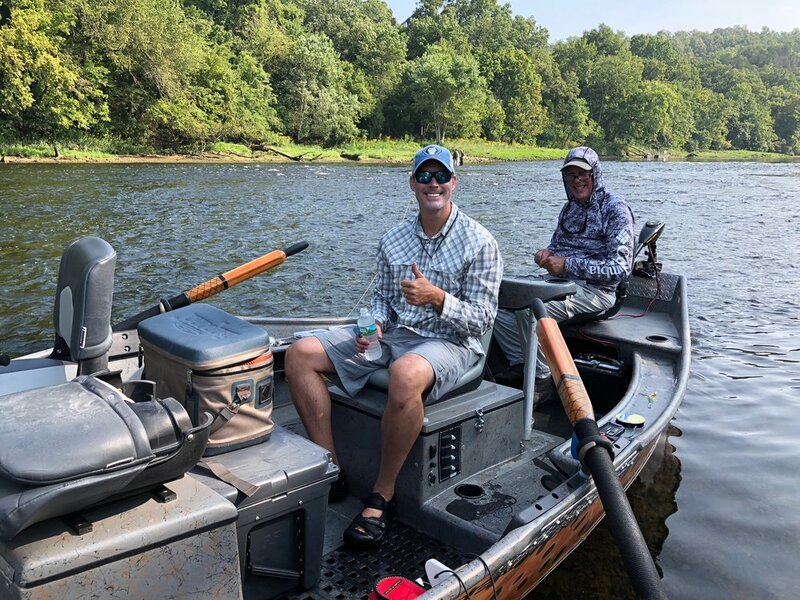 I was able to get out the last couple days and knock some of the dust off, look for the shallower bodies of water they warm up quicker, the fish are still moving slow so you need to move the fly pretty slow. I’v had the most success rolling a Starlite leech on the bottom. If you feel resistance set the hook the take is definitely more of a slow pull than a quick grab. The weather looks like it’s moving in the right direction. I’m ready for the big water to start warming and it’ll be game on. Get out and fish there’s some fish ready to eat your fly. Winter has been rough, especially when you’re trying to fish, we never really had those weeks of warm snaps to be able to get on the water. Most bodies of water have had ice since the first part of the year and air temps and snow have made it hard to find a day to get out. Hopefully we’ve made the turn and spring is on the way, you can only tie some many flies in preparation before you start to go insane. Finally we caught a day and found the first handful of fish for 2019. I’m already to get back in the swing of things. Paul Brown with a decent hybrid on the fly. Local Musky fishing with Dave Pitt this Saturday at K&K presentation starts at 9. It’s supposed to be cold and nasty might as well check it out. The Missouri Smallmouth Alliance is having a fund raising event and hosting Brian “Lucky” Porter on February 23rd at the Schlafly Bottleworks the event goes from 5p-9p. The money raised is going to a statewide informational sign that will be posted at river access points and distributed to business across the state. A portion will also go to the Missouri Chapters of The Fallen Outdoors and Project Healing Waters. It should be a fun event and raise money for a handful of great causes. I attached a link for the event below, also checkout the Missouri Smallmouth Alliance website, there’s also a link to join on there site, strength in numbers join and help support a good cause. Short fishing video from this fall, we found the hybrids that day. 8wts and ARC streamer 17s got a workout. It’s -5 degrees out, here’s a couple videos to get you through the day. I think I’m going to have to hit those east coast salt ponds to catch striper on a cinder worm, old video but looks fun. ARC’s Streamer 17 has been out for several months now, I’ve been fishing a prototype for awhile going on a couple years. If you’re looking for a type 6 sink tip there’s no better on the market. The Streamer 17 has a 17 foot sink tip that goes straight into a floater making it easy to manage your line and easy to cast. It has the same technology as the rest of the ARC line up made of 100% polyurethane thermoplastic, a solvent free material that isn’t affected by UV rays, sun screen, or insect repellent. The Response core is a low stretch core with only a 6 % stretch factor meaning quicker hook sets and better casting accuracy. If you need to get your streamer down in a hurry a 6-7 inch per second sink rate. This is definitely my go to line in moving water and when the whites and hybrids have moved to deeper water, it gets you fly into the feeding zone. Local company with great customer service, why would you fish anything else? Trout Park Flies this Saturday at K&K, classes are free and start at 9am. This little warm up has made it possible to pick up some warm water fish this past week or so. It’s a grind but how can you complain about catching fish in late December. If there’s no ice I feel like catching bass on the fly is possible. I like to target the shallowest water I can find, shallow water is most effected by the temps, first to warm up and first to cool off. You have to get the fly down, you can tell from the pics that all but one fish is really bleached out meaning he’s likely been on the bottom. Sink tips with around a 6 foot leader and flies that ride hook point up are my favorite. I’ve been fishing a lot of black and chartreuse starlight leeches with good success. Short slow strips or long slow pulls, you’ve got to be ready the takes are very subtle, I like to error on the side of over setting vs not setting the hook enough. If the weather holds of and you can tough the air temps there’s definitely fish to be caught. The urban trout slayer Paul Taylor showing off some flies this Saturday at K&K, class starts at 9. As fall starts to transition into winter, air and water temps begin to drop. The falling temperatures have a direct impact on the whites and hybrids. A couple weeks ago when the temps were in the mid 50s it was a feeding frenzy fish were wrecking shad all over the lake, I’m pretty sure the fish were having a shad eating contest. This time of year especially here in the Midwest can be difficult on everyone including the fish one day it’s 50 degrees and sunny, the next 28 degrees and snowing. The inconsistency of the weather makes it very hard to pattern these fish, knowing what kind of water the fish should be in really helps locating them, but these fish are roamers and nothing is a sure thing. 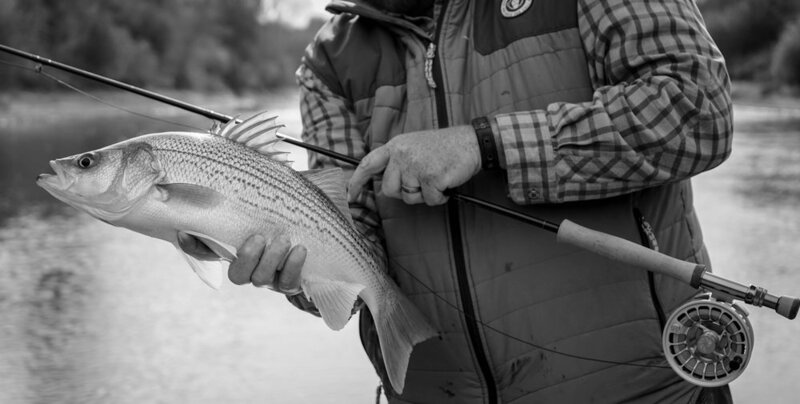 Fall can be almost as good as Spring for targeting whites and hybrids on the fly. 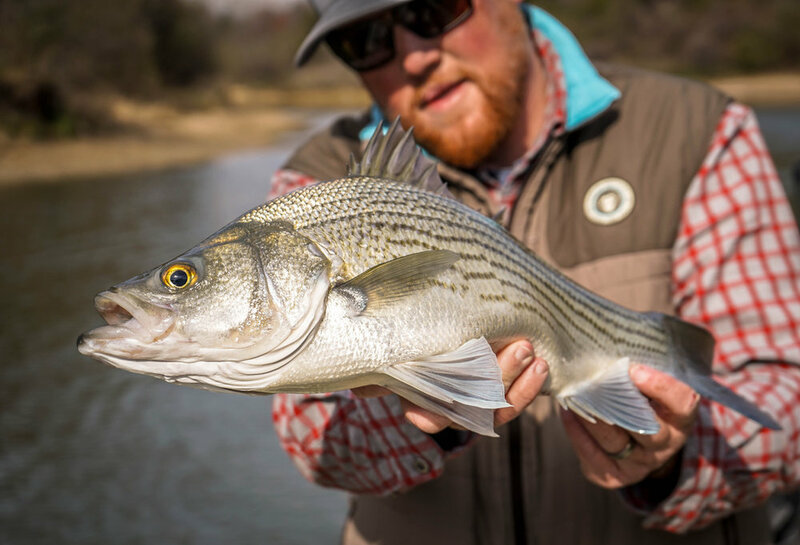 The water begins to cool and the fish move from the depths to start terrorizing shad in shallower water. The hot spots are typically the main lake points, old road beds and river channels, and wind blown banks. These fish are structurally oriented just a little different structure than your large and smallmouth bass. The points and wind blown banks are where we focus most of our energy. The fish are shallow enough to get to with a fly even with a floating line when they’re hugging the banks. If it’s windy enough to create a mud line fishing the lines can be productive as well. Depending on the depth of the point it may require a sink tip to get into their feeding zone. 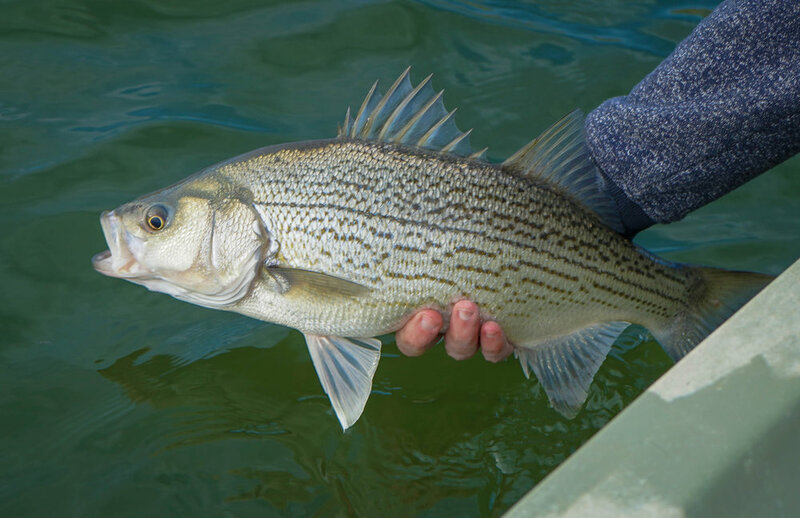 The fish can really feel the cooler weather coming on and start loading up on shad to get them through winter. Towards the end of fall the fish start transitioning in to the wintering areas. When the water on the lakes drops into the 40s the fish really start to slow down. There’s definitely still fish to be caught but they move into deeper water making it harder to get to on the fly. 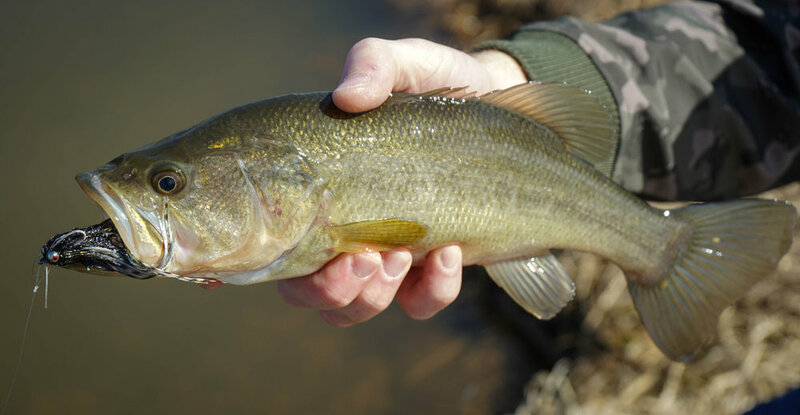 Locating them can be more a challenge, but they will feed on shad all winter long. The best places to target them are in the local tailwaters and the power plant lakes. In the tailwaters I like to focus on the current breaks, eddies, and seams. Really any spot that provides and ambush point. We’re lucky enough to have some warm water power plant lakes in the area, which can provide productive fishing all winter long. The major reasons these are so productive are first the temps the water coming out of the power plant is usually in the 60s. Two the water coming out provides a current and these fish are “river fish” and love moving water. I fish sink tips 100% of the time when fishing moving water. The warm water in the power plants have the fish so confused they don’t know which way is up, it’s spring all year long. Whites and Hybrids primary food source is shad, both gizzard and thread fin shad. Flies should resemble the baitfish. Some of my favorite are: SF minnows weighted and un-weighted, game changers, and deceivers. I said it before but I throw sink tips in the moving water 100% of the time. I want to get the fly down in the feeding zone as quick as possible. My favorite flies are the synthetic SF fiber minnows. You can trim them to match the size of baitfish without sacrificing movement. Most saltwater style baitfish patterns are very effective on these fish. Un-Weighted SF Minnow very effective thrown on a sink tip. 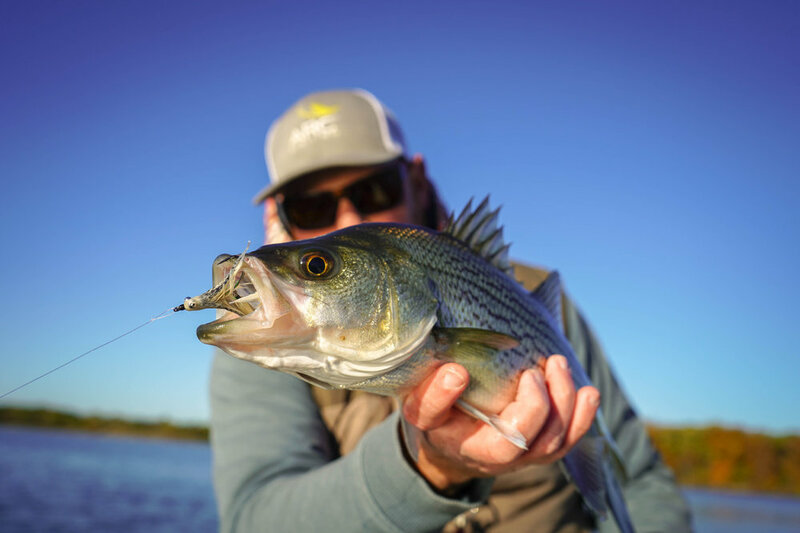 Lefty’s Deceivers are another great pattern for targeting these fish. Weighted SF Minnows are always at the top of my list. Weighted with Fish Skull Baitfish Heads. 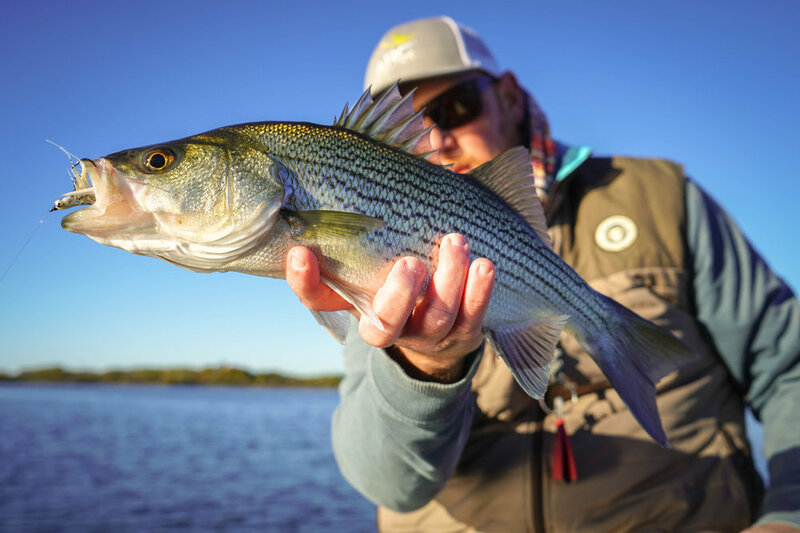 There’s some good fishing to be had if you’re willing to get out and fight the cooler weather. The cooling water temps really have the hybrids active, the last couple days we’ve fished in the morning and on the way to the lake Sunday my car was saying it was 28 degrees. 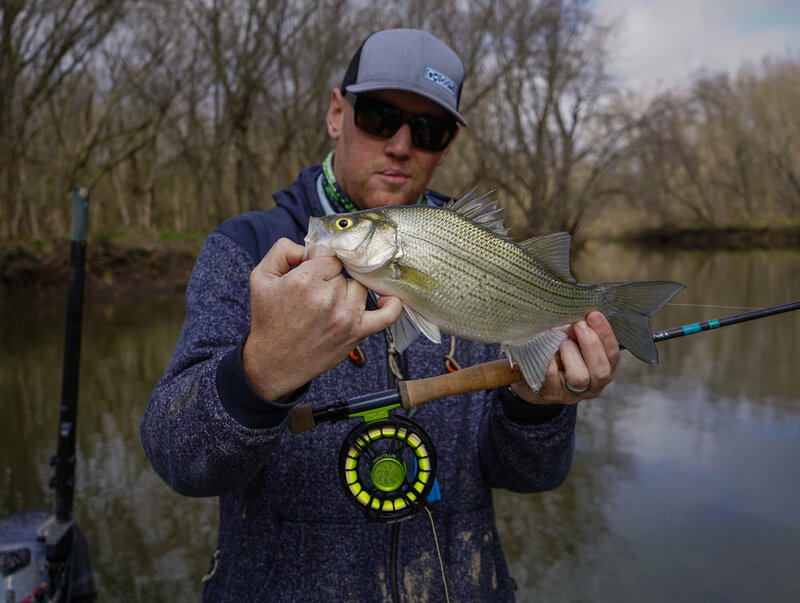 The sun being on the water has been a good thing, water temps have been in the upper 50s which is ideal for catching these guys in the fly, they’ve moved up into shallower water we’ve found them on the down wind side close to the bank and on ledges next to drop offs. I would get out as much as possible the next couple weeks hopefully these water temps will hang on for a bit but the overnight lows have started to really drop. Throw anything that looks like a shad, I’ve been fishing a 4.5 inch feather game changer on a sink and have picked up a few. We’ve been missing way more fish than we’ve been landing. Get out before it gets too cold. 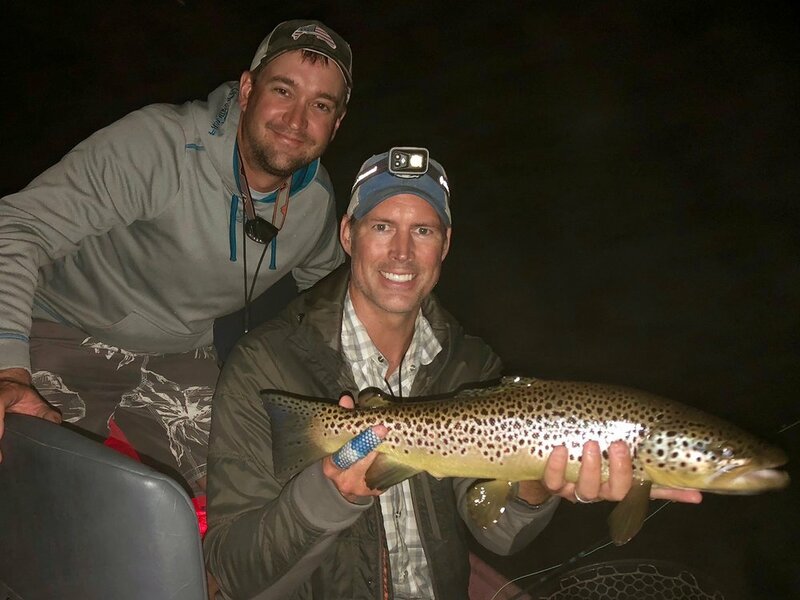 A few of the highlights of Parkers recent trip, some solid night time browns.